I thought you might like to see who is who in the Fawnskin Chamber. 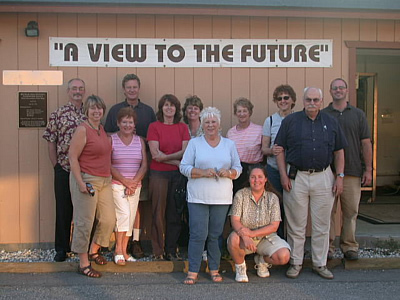 The group has 32 members as of August 1, 2005. Front Row: (Left to Right) Janet, Karin,Cynthia, Mayor Lori, Diana G. (me!) Andy. Back Row: (Left to Right) BBARWA’s Steve Schindler General Manager, Jim, Val, Doris, Rita and BBARWA’s Joe Hanford Interim Plant Superintendent. Fawnskin and Grout Bay are mentioned (along with BBARWA) as places to visit in the book, A Birder’s Guide to Southern California by Brad Schram. The book was published in 1998 by the American Birding Association, Inc. in Colorado Springs. This entry was posted on Tuesday, August 2nd, 2005 and is filed under Uncategorized.